Hi everyone! 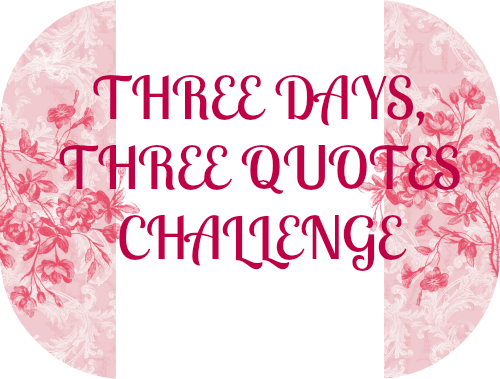 Today I’m here with my third and final quote for this challenge. I have really enjoyed taking part so thanks again to Erika for tagging me. Today’s quote comes from another of my favourite ever books (and also one of the prettiest books that I own) and I picked it because it was one of those quotes that just really struck a chord with me when I read it in the book and has stayed with me. So without further ado (and rambling) here it is. . .
‘It sets a dangerous precedent’. I feel like this is such an important quote and general life lesson; never give up! We all go through pain and it’s impossible to avoid, and if we spent our whole lives trying to protect ourselves from it then we wouldn’t really be living! I hope that you enjoyed my posts for this challenge! It’s a great quote, just a few words that say so much!